Last Thursday I was finally able to catch Venezulean band Los Amigos Invisibles in concert. They have been eluding me for years: a couple of years ago in Carlos & Charlie’s here by the lake, they played in ACL last year, they played in Havana in Monterrey while I was there. And for one reason or another I couldn’t go. Right before the concert I headed to a nearby bar for a few beers. 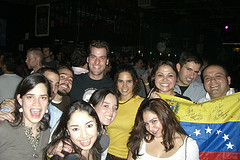 Over there, I met with a few friends and some people from Mexico and from Venezuela that I’d never met before. I pointed out that the concert could start any minute now but those guys seemed very confident about the schedule and very calmly stated that there was still time. A few minutes later they got up and left, saying they had to go to work. Very nice guys. Happened to be in the band. One of those strange connections: sister of a friend of a sister of a friend is married to the band’s bassist (see at 00:45 for explanation). 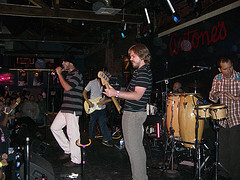 The concert was at Antone’s. Los Amigos played for about two hours straight. The coolest part is that they play non-stop: no gaps between songs at all, they just finish one and smoothly move on to the next song. Great concert. Highly recommended. On Friday I was supposed to go to see Smashing Pumpkins, but it got postponed. So no more preparation before The Big One.